Early morning sunlight illuminated my tent. For the seventeenth day in a row, I heard the propane of our backpacking stove whispering on the picnic table outside and Jason rustling coffee from a pannier. Watching the light play on the dome of the tent I retraced the route from our prior day’s riding. The fruit stands and farmland, a gut wrenching climb right after lunch, a few frustrated tears, the stellar cup of coffee that put a little town on the map. This is the life! Fresh out of college and hungry to know the world, adventure called around every corner. Little did we know that when we started pedaling south we were opening a door that would reshape our lives. We migrated, cycling from campground to campground, relishing the simplicity of few belongings and the spontaneous nature of each day en route. Our lives were packed neatly in old panniers. With no spare room for distracting stuff we turned our attention to the people we met, the landscapes we wandered, and the challenges of moving by our own means. With 1000 miles and nineteen days of touring under our belts we were full of ambition and creative energy. Back home again, we designed and made the first of what would be thousands of sets of panniers. The obsession with creating high quality gear seeded itself, and we had no idea that we were embarking on an adventure that would test our ambitions like no other. My heart soared as I looked over the central Oregon desert. I had slipped from camp in the predawn hours and daybreak revealed the stunning vastness surrounding me as I churned along the dusty road. So began day three of Oregon Outback, a gravel exodus along the state’s central bisect. For some it was a race, for most an unmatched challenge, and for everyone it was a celebration of backcountry travel by bicycle. It was remote, self supported, and unsanctioned. Exactly what we wanted. Jason and I signed on to test our backcountry skills, endurance, and relish the camaraderie of an expedition. For months leading up to the ride, the feat had demanded unparalled physical focus and stoked my design skills with a fresh assignment. At the drawing board, I weighed what little I knew of the route and terrain and drafted a low-volume pannier made out of light materials that would bare the adventure with tried-and-true resilience. There I was, poised to drop into a sage-lined basin with my panniers and gear packed with expert efficiency and I felt recharged and amped to move on. Mile by mile I could feel Oregon Outback etching me with some inner mark of transformation that would compel growth and tug at my wanderlust. As gear makers, an ulterior motive lies in each adventure we head out on: it’s a quest to make better and better bicycle bags. We figure that the best way to make the bags we dream about is to chase the open road. 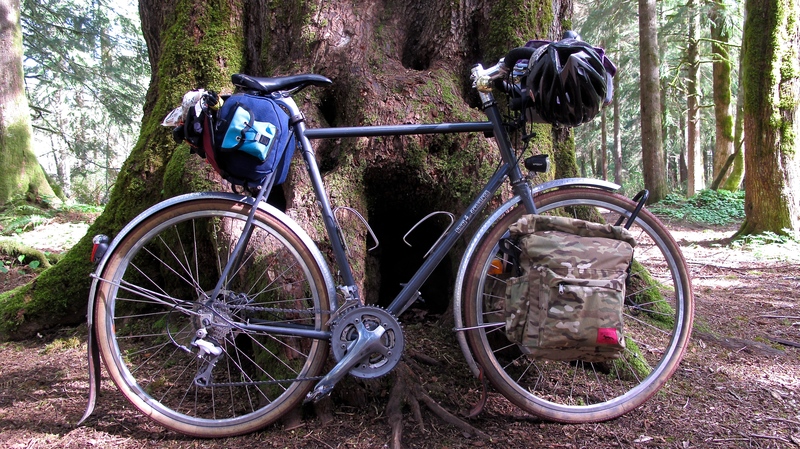 We circled the Olympic National Park on dirt roads and trails in order to perfect the Junior Ranger panniers we had drafted for Oregon Outback. Jason and I made ourselves at home in our vagrant ways and the Range Tour started off without a hitch. Four days later, on the western section of our route, the clouds darkened and the plot thickened. I came to understand that the foothills of the Olympic Mountains would toss me up and down like a small craft on ocean waves with hardly a witness. For miles we’d creep along tacky, muddy logging roads only to find summit after summit enveloped in dense, dripping fog. There were no vistas. There were no whoops of joy. The descents were so cold we’d dawn our trustworthy woolens and pull trash bags over our torsos only to drop down the opposite slope with chattering teeth. I cursed over my breath: who is insane enough to call this vacation? When the southern sun punched through a hole in the clouds our tempo picked up and our days were spent in the content concentration of staggering climbs. It’s easy to draw parallels between creating a small business and the feats of life on the road. It’s all about your attitude–if you fight the challenge it will wrestle back. On epic ascents in the worst of all weather one learns how to move fluidly with the circumstances at hand. You know yourself better for it, and the rewards are as awe-inspiring as the craggy alpine views we chase.